There are lots of tools to help with collaborative decision making. Last week around 100 social movement makers put their brains together for two days and shared best practice and strategies to successfully build social movements. Why? Well they were at the ‘Losing Control’ event organised by Practical Governance and The Social Change Agency as part of the Marmalade fringe in Oxford. Shared decision making is at the heart of many movements. Here’s three tips we picked up which can help community businesses make sure the whole community is involved in decision making, without (as many) headaches. A bit jargony but ‘horizontal communications’ is all about sharing knowledge so people can make decisions based on the same information. Many organisations mentioned Slack as a free online platform they use to share news and views, and engage their community in a conversation rather than broadcast. Community members will just need an email address to join. Some social movements are taking platforms like these a step further and using them as online co-working spaces. Dina Ariss from CHAYN, an organisation run by 300 volunteers from around the world that create opensource toolkits for women to fight domestic abuse without a lawyer, explained how they use Slack to work on a specific document together. Paul Steedman from Friends of the Earth said they use it to co-design campaigns with active members. So plenty of scope for community businesses to suit the platform to their needs. One of the challenges of a community business is having to share the decision making with so many people. The democractic voting model can work but sometimes it feels like the same people are always in the minority. Andy Goldring from the Permaculture Association and Kayleigh Walsh from Outlandish explained their organisations both use ‘sociocracy’, ‘a collaborative governance method based on effective organization, distributed authority, and inclusive decision-making.to make shared decisions’. It’s an inclusive way of setting up a community business, or re-aligning your priorities. 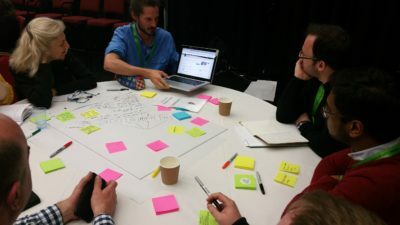 Many movement makers mentioned they use Loomio, an online decision making tool started by a workers’ cooperative in New Zealand. Tamas Hovanyecz from Social Fokus on Technology gave us a live demo and showed how you evolve the discussion from a platform like Slack to giving people the opportunity to vote (and ask questions) about a proposal on Loomio. You set deadlines for decisions but you also set the percentage of people involved who need to vote for the decision to count. So for example, you could say if 35% of your members vote, then the decision is valid. The more members you have, the more people that would be. Another tool that Tamas mentioned which could be useful for community businesses when making funding decisions is Cobudget, a collaborative funding tool. Worth a look. Who isn’t in the room? One of the barriers to using these tools of course is being confident with computers. Many people in communities still aren’t, or don’t have access to a computer which means they are being left out of debates and decision making that directly affects them. This is why giving your community internet access and training, as well as face to face communication and engagement is important. And as Paul Steedman from Friends of the Earth suggested organise activities such as gardening or cooking to attract an array of people, not just ‘meetings’ which might intimidate people. You could always enlist the help of a Community Organiser. 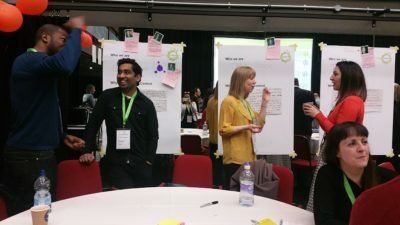 Finally, Immy Kaur from Impact Hub Birmingham highlighted two common barriers which are often overlooked – providing free childcare and travel stipends can really make a huge difference to who is able to attend.